The desert winds, warm and caressing, whisper secrets as they blow across the sun-bleached Western Nevada landscape. This terrain is a place for loners and outcasts, a final resting place for slowly rusting abandoned vehicles, a location where cold-blooded serial killers might hide their murdered bodies, where meth labs stealthily cook their poisonous product in derelict cabins and where thin beams of sunlight squeeze through cracks in crumbling walls… It is also home to The Clown Motel, a motor inn completely themed around the red-nosed circus character that is at once beloved and shunned. To some, clowns represent fun, joy and frivolity; to others, they conjure nightmare images of fear and uncertainty, but most, I believe, walk the tightrope wire somewhere in between. 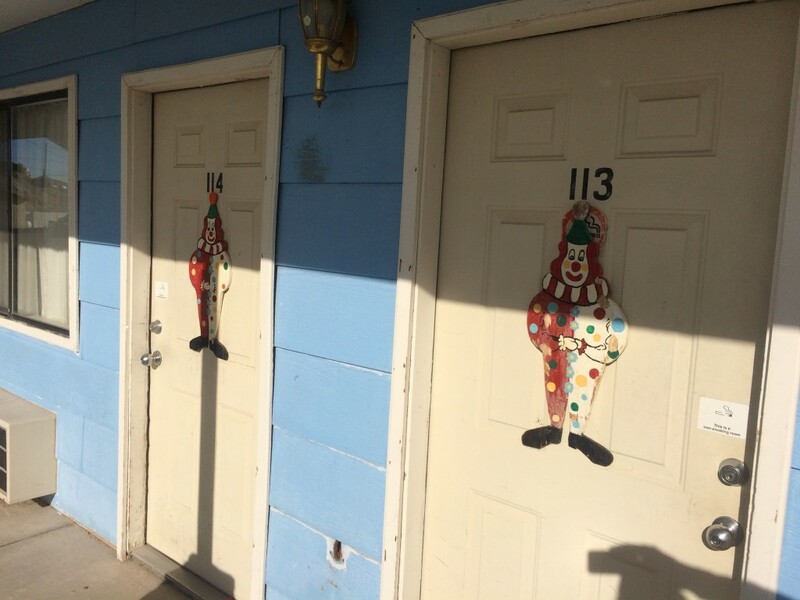 Clowns can be good or bad, depending on their context. Merriam-Webster Dictionary has even added the word Coulrophobia, fear of clowns, to its collection of definitions. 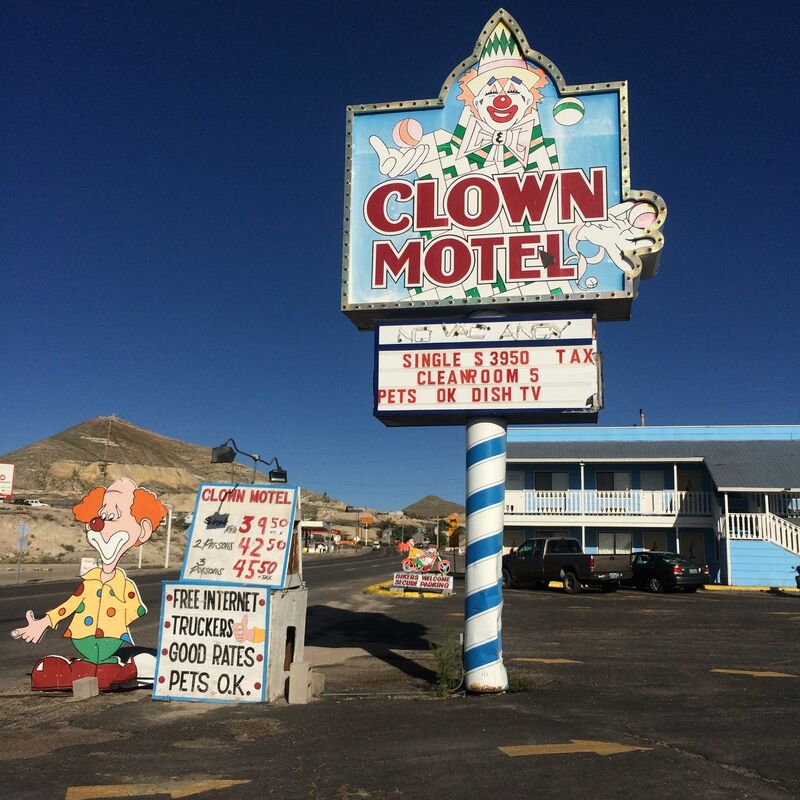 Given the odd role of clowns in our collective American imagination, in which they are intertwined with psychopaths (John Wayne Gacy) or horror movies (Captain Spaulding in Rob Zombie’s “House of 1,000 Corpses”), why a Clown Motel? And why in the middle of literally nowhere, Tonopah, Nevada, pop 2,478? 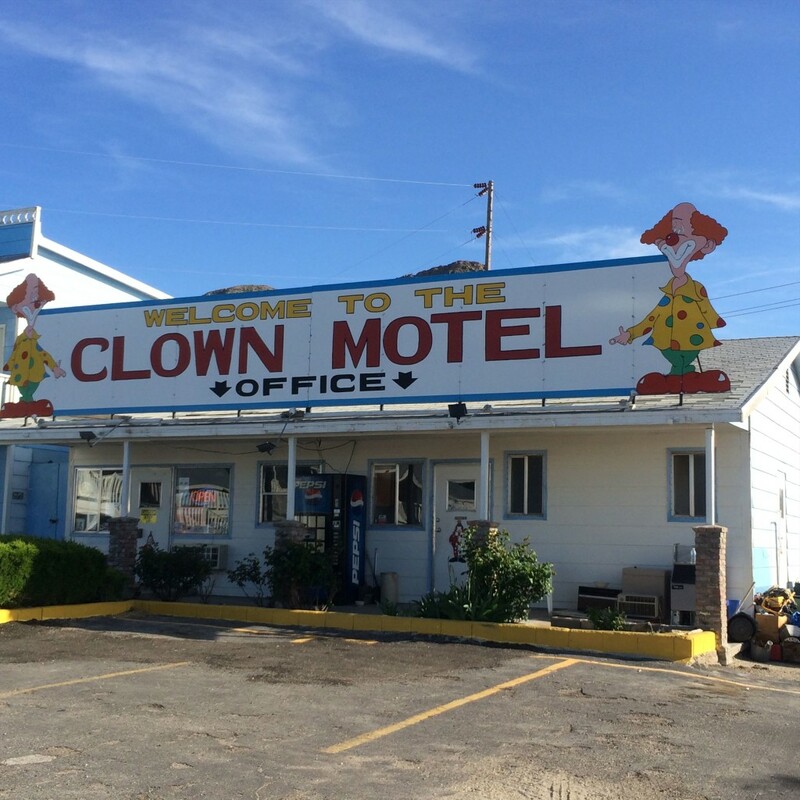 Talking to the friendly and down-to-earth desk clerk, I found out that this collection of clowns was started here in the 1940s and their presence became the theme of this motel after it was purchased by its current owner in 1991. 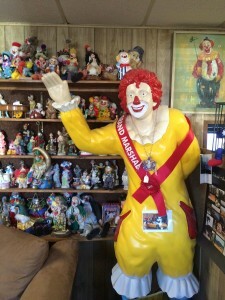 The lobby contains over 500 clown figurines and the number keeps growing through donations sent from far and wide. 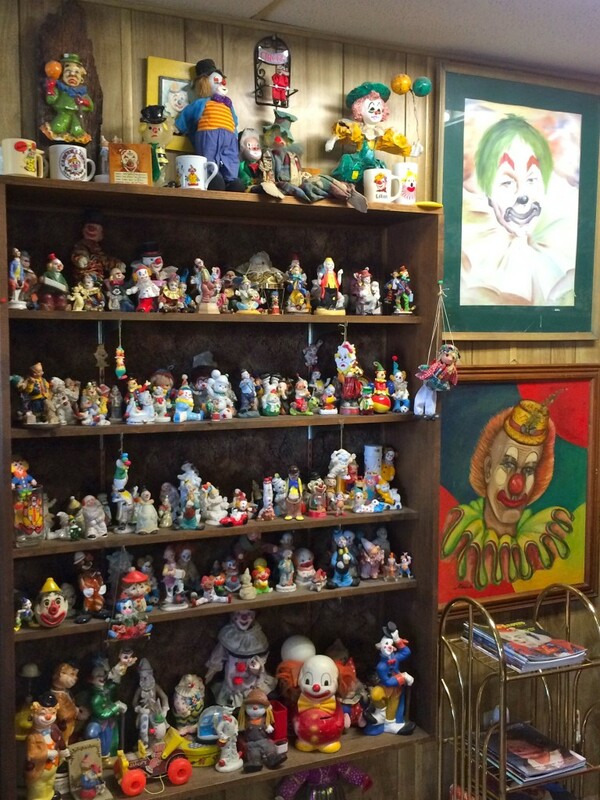 The rooms are each centered around a specific clown portrait, but not as elaborately decorated as the lobby. The desk clerk also weighed in on the haunting of another Tonopah landmark, the 1907 built Mizpah Hotel, which was the tallest building in Nevada until 1929. 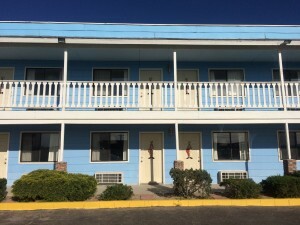 She told me that there are seven entities known to exist at the hotel, which was named after the Mizpah Mine, and she, herself, had met up with several. 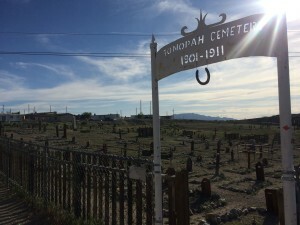 That information was more than enough to give me an uneasy feeling about Tonopah, though I’m sure there are many braver than me. As my friends and I left this dusty town and encountered hollowed-out car frames at the end of several cul de sacs, we decided that if ghosts really do exist, we are quite sure they are haunting Tonopah. 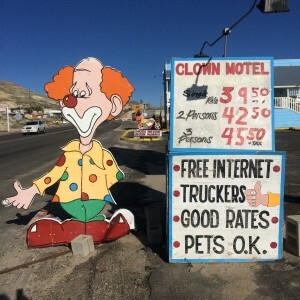 This entry was posted in Attractions, Miscellanious, Offbeat LA and tagged Clown Motel, Desert, Nevada, Nikki Kreuzer, Offbeat LA. Bookmark the permalink. “It” and “Poltergeist” ruined clowns for me forever. This is nightmare town!